My thoughts on “IKASUZE IDOL 1.2.3! !”, the major label debut album from Melon Batake a go go. If you had come to me a year ago and told me that I would be reviewing a major label debut album from a Rockabilly Idol group who are also superhero aliens from outer space I would have probably thought you were crazy. Not so much about the alien superhero part but more the fact that an Idol group would choose to base their sound in a genre like Rockabilly. Definitely not something I thought I would ever hear from even a genre as diverse as Idol. Well I am reviewing said major label debut album from Melon Batake a go go, an Idol group from outer space who are also superheros. They’re a 4-piece who are managed and produced by some real Rockabilly types so things are definitely being done right in that regard as well. The group has been around for a couple of years now but it’s only in 2018 that they’ve really started to gain popularity and start releasing their music more widely. I reviewed their first mini-album “SICKxIDOLSxSICK” on the site last year and you can check that out here if you want some idea of what to expect. 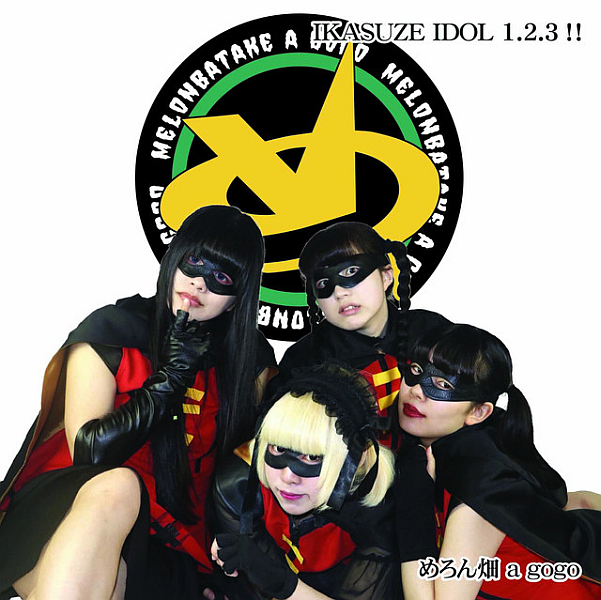 “IKASUZE IDOL 1.2.3! !” is the group’s first album along with being their major label debut on the Nippon Columbia label. While the majority of the songs are brand new, a good chunk of this album has been available for a few months prior to this release in the form of a venue/mail order only indie release. Without giving too much away I will say that I’ve been playing that CD rather heavily in that time and that Melon Batake a go go are one of my favorite groups right now. There’s still several songs on here that I’ve never heard or only heard live though so I’m eager to dive in and share my thoughts with you. Let’s do it! “IKASUZE IDOL 1.2.3! !” puts its best foot forward, starting off with what is one of my favorite Idol songs in recent memory in “SICK IDOLS” (it also follows on from the opening track of “SICKxIDOLSxSICK”). If you ever wanted to know what an Idol group doing Rockabilly music sounded like then this is a perfect example of that. The influences from both the Country and Boogie genres are apparent in the song’s instrumental which also has an element of Horror to it as well. The tempo makes you want to nod your head and dance despite not being that quick, though it does keep a consistent energy outside of when it ramps up a bit for the chorus. The vocals are performed in a very natural tone for the most part, though there are moments that call for a more exaggerated delivery. That’s going to be a theme by the way, as is the hook laden lyrics that see the Idol side of things creep in a little. This song is ridiculously catchy with a great beat and a bunch of things you’ve probably never heard before. It’s impossible for me to put into words how highly I recommend it. Keeping the strong start going is “HORROR BILLY NIGHTS” which I think might be the only song that made the cut from Melon Batake’s “SICKxIDOLSxSICK mini-album. Again, you can read all of my thoughts on that release here if you want to. As the title states, this song, and a lot of Melon Batake’s songs for that matter, is a Horrorbilly song. That means things have an even more eerie feel to them in the instrumental, with some absolutely awesome “spooky synth” combining with the trusted Rockabilly drumbeats and guitar riffs to once again create something that most people probably haven’t heard before from an Idol group. We ham it up a little on the vocals to match the mood, with some wailing and other unsettling noises being used to great effect. Once again don’t expect much in the way of cutesy Idol singing and really it would be totally out of place here anyway. I should also once again mention how much I like the chorus on this song, it’s pretty simple but so catchy. Melon Batake really have a knack for that kind of thing it seems. I wasn’t totally sure if I’d heard “IDOL FROM PLAN9” before this album release but I’m pretty sure Melon Batake played it live at least once when I was over in Japan. Anyway, yes that is a pretty thrashy interpretation of the Batman and Robin theme tune that you’re hearing in this song which makes sense given Melon Batake’s costuming (though they’ve since got new ones). It’s a bit like an introduction song for the group I suppose, and the uptempo Rockabilly instrumental is definitely an appropriate advertisement for what’s on offer here. Probably the closest to a traditional Rockabilly song we’ve heard on the album so far and that guitar solo in particular was pretty awesome stuff. The vocals on this one have a good energy despite their lower tones and the repetitive nature of the lyrics is catchy without feeling like it ever gets too boring. The song is only a little over two and a half minutes but Melon Batake do more here and deliver a more enjoyable product than a lot of groups I know who pump out five minute songs on the regular. Something for other producers to consider perhaps. Track 4 sees Melon Batake try their hand at a cover of “She Said” by Hasil Adkins and made famous by The Cramps. Wearing our influences on our sleeve with this one for sure. It takes a little while to get going, what with there being a monologue set to the sound of falling rain to kick things off but we do eventually get into the swing of things. I’ve seen this song live a few times and as best I can tell they’ve changed it up a bit for the album version as I do remember it having more of an Idol feel in person. The pacing feels a bit slower on the album track too but these things do make it more in line with the original so I guess if that’s what they were going for it worked out. It’s a pretty straight forward song vocally so the spoken word parts of the song in my opinion are the most interesting element but I still find the complete package to be an enjoyable listen. If you were looking for more songs with an authentic Rockabilly sound from Melon Batake then this comes pretty close. I do think the song comes across much better in a live setting than on CD though. I’m not really sure what to say about “YAM YAM POO POO” in all honesty. I did ask about the title and subsequent lyrics and was somewhat embarrassedly assured they were correct so there you go. Humorous title aside, I really like the instrumental on this song a whole lot. It has this great unsettling vibe to it that is once again provided by some creative use of synthesizer effects. Combining that with some Blues style guitar makes you think you’re listening to a scene from an old school movie or something along those lines. I’m not sure if this song is supposed to be humorous or not but considering the fact that the girls are struggling to contain their laughter at times while delivering their lines perhaps speaks for itself. They also ham things up quite a bit on this one which is totally fine by me. There are actually some moments of rather brilliant harmonizing that will unfortunately be overlooked but this song is just a bit of weird fun. Something that Melon Batake are more than happy to provide us with both on stage and off. The midway point of the album is marked with another cover song. The time the song in question is “Yaketara Match” which was originally released by Yajikan BG-R who are a band that Melon Batake’s producer Kinoshita Moritaka used to play bass for. We ditch the Billy here for a straight up Rock song with an incredibly familiar and dominating guitar riff that I just can’t seem to place where I’ve heard it before. It provides the song with a good energy though so don’t think I’m complaining about it. There’s also a pretty sweet guitar solo in this song too which deserves a mention, even if it does feel like it goes on for a while sans any singing. Speaking of which, the singing on this track comprises mainly of gang vocals which given the roughness provided to the song by the distortion on the guitars fits really well. Only thing I will note is that the vocals are mixed pretty well into the instrumental so if that’s not your thing you have been warned. I’m totally down with that style though and I’m also totally down with this song, that guitar riff is so damn catchy man. Continuing on with the more Rock leaning instrumentals is “Tayori ni Shiteru ze”. Like “Yaketara Match”, this song also has a very familiar guitar riff that I’m once again struggling to place. Imagine if I was actually getting paid for these reviews. Anyway, the main riff does a great job of being catchy and keeping your attention throughout the song so thumbs up there. We’re also going with some fairly heavy distortion once again, which makes the instrumental feel a lot more substantial than it would have without it. This isn’t as much of a feature when the vocals are present however so while this song does mix the vocals lower than most Idol songs they’re not being totally dominated by the instrumental either. The vocals on this song more than match the instrumental too, being delivered with a fire and attitude befitting of a grungy Rock song. They’re still catchy though, as this is an Idol group after all but once again Melon Batake show that you can really do a lot with a more natural tone of singing voice. This song is great, definitely one of my favorites from this album though competition is very strong. If all of this Rock nonsense was getting a bit too much for you then the album’s eighth track “BABY” should be the perfect palette cleanser. This is a very mellow song, especially compared to everything else on the album up to this point. The instrumental sort of has a Dream Pop quality to it, with some mild fuzz to create more of a feeling of warmth. Despite there being quite a lot going on in terms of guitar and synthesizer it is the drumbeat which is very apparent in the instrumental, which I thought was an interesting choice. The song doesn’t really move through the gears that much, instead finding a steady pace and sticking to it for the most part. We also get to hear a softer side to Melon Batake with the vocals, which sound a lot more Idol-like than you normally hear from them so I guess if you haven’t liked anything else so far then this song might be more to your tastes. Joking aside, there’s some pretty nice harmonies on this track and it’s cool to hear Melon Batake’s softer side every now and then. Not really what I’m into the group for but it’s still an enjoyable song. Following on from that, we have another cover in “TRAIN”. This song is originally by Japanese Psychobilly band SPIKE so if anyone was looking for some further listening then by all means. This song takes a little bit to get going and you would be forgiven for initially thinking it might be another rather mellow affair. Once it’s up and running though we’re treated to what I would consider a very faithful interpretation of a Rockabilly song, outside of the slightly more Pop leaning vocal delivery anyway. There’s some pretty cool guitar riffs on this one that I found to be particularly enjoyable and give the song some added character. The chorus was also really catchy so that’s always good, though I did feel like the instrumental sort of faded a bit too much into the background during it. I haven’t heard the original though so that could just be how the song is supposed to sound. While not being quite as flashy as some of the other songs on the album, I feel like this should definitely be considered essential listening. Given all of the other references to the Horror genre on this album, it should probably come as no surprise that a song titled “I WAS A TEENAGE ALIEN” ended up on here. The instrumental track for this song also plays up to the Horror movie theme, with a very dense and eerie combination of both guitar and synthesizer. I was reminded quite a bit of the GARUDA solo project from group member Sakimura Yuffie when listening to this one. The instrumental is very reminiscent of the sort of work she (along with Melon Batake’s producer) has produced in the past. By that I mean heavily distorted guitars, more than a little bit of an Industrial feel…but without all of the wailing synthesizers that feature on this particular song. The vocals aren’t quite as spooky as the instrumental that accompanies them however. In fact, outside of the few instances where they opt for some comedic scary voices they would probably sound like fairly normal Idol vocals if you stripped out the instrumental. I think it’s a good choice here because the instrumental is already very overbearing so the lighter vocals break it up a bit. The amount of stylistic variety on this album is pretty impressive. As if this album couldn’t get any more diverse, “Kōya no IDOL” takes us on a trip to the Wild West with its very old school Western movie style opening. I guess it makes sense, given Rockabilly’s roots in Country music after all. They lay it on pretty thick for this song too, with said themes being continued for pretty much the entire duration. It’s a pretty slow affair by Melon Batake standards and doesn’t have quite the same energy that most of the rest of this album does either. It’s a similar story with the vocals too, with them taking on a fairly sombre tone for much of the song. There’s a few moments where there’s some dialogue that injects a bit more personality but outside of those sorts of theatrics this is pretty straightforward stuff. While this song definitely stands out from much of the rest of this album, I get the feeling that it’s going to be overlooked for the more flashy offerings. It’s understandable why that would be the case but this is still a pretty unique song that I would encourage people to check out. Just like that we hit the closing credits of “IKASUZE IDOL 1.2.3!!”. I mean, that’s pretty much what “IDOL FROM ANOTHER PLANET” sounds like so it’s fitting that it would be the last song on the album. The instrumental has a triumphant feel to it, like Melon Batake are about to return home after saving the world from evil or something. This initially takes the form of an 80s Synth Pop inspired instrumental before bringing in guitar and drums to fill things out a bit. The song ends up getting pretty fuzzy after a while but they manage to keep the tone light through all of that which is pretty impressive. This also does a pretty good job of making what would otherwise be a fairly normal sounding Pop Idol song interesting to someone like me which I always think is a good thing. I also enjoyed how they literally sang one of the synthesizer melodies at multiple points during the song. A nice bright and hopeful ending to a wonderful album, an absolutely perfect note to end things on. I don’t think words can really sum up how much I love this album. It has pretty much everything I want in an album, be it fun guitar riffs, great melodies, catchy vocal hooks, a ton of personality…the list goes on and on. It’s also incredibly easy to listen to from beginning to end, with enough variety that the mind is never tempted to wander while listening. If anything comes close to being as good as “IKASUZE IDOL 1.2.3! !” then 2019 is going to be an awesome year for new music. If people weren’t already paying attention to Melon Batake then they probably are now. Its been a whirlwind 12 months or so for the group who have pretty much come out of nowhere and released what will definitely be one of the best albums of 2019. That’s going to be a tough act to follow but given the people involved and the places they’re pulling inspiration from I think we’re in for a colorful 2019 as far as this group is concerned. Oh yeah, they’re coming to Europe in a couple of months too.